“Nonprofits have a lot to gain by creating affordable, comfortable spaces for their nonprofit environment,” according to interior designer, Jodi Harmon of Finishing Touch Interiors. 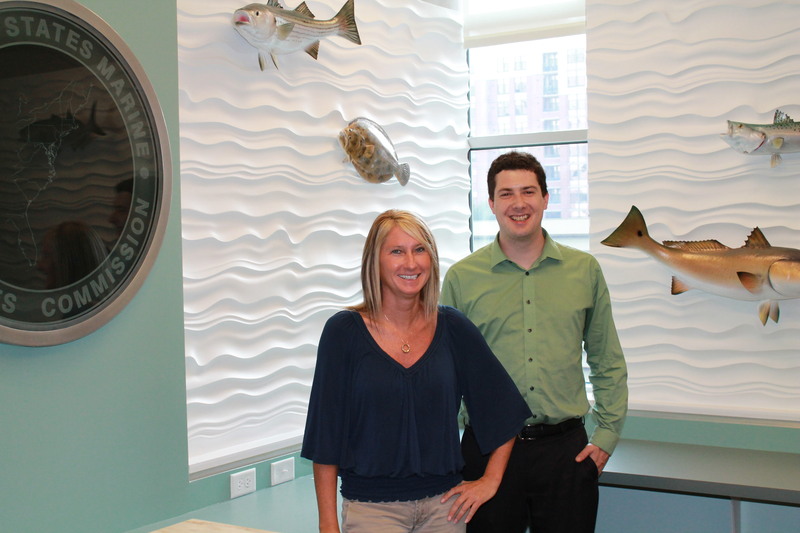 When I conducted the photo shoot for the Atlantic Marine Fisheries Commission, I was blown away by how wonderfully they incorporated their mission into their space. My favorite touches are the fish, you simply cannot get any closer to their mission. They also incorporated the logo, waves, and the perfect color scheme throughout the office. To get this look for your space, start with a plan. Hire a designer to really invest in a strong workable space. Don’t have the budget to hire a designer? Consider hiring a designer for a few hours to help set up the plans you can implement on your own; and if there is no budget for that, check out ideas on Pintrest. Find something you like and copy it for your space. Next assess the space you are in today. What needs to go? Are things worn, faded, torn, cluttered? Does the furniture you have meet the needs of your office, or is it simply there because it was donated to your organization? How about lighting? Lighting plays an important role in creating a productive space. Make sure to allow natural light into the room when possible, add lamps for accents and additional lighting. Keep in mind, the space you are in tells a story about your organization. Does your current space tell the story it should? Change lamp shades to add color a room. Use rugs to warm the room and cover worn flooring. Add accent pillows to create a splash of color. Bring in photography or art work that shares your mission. Consider making this a project to garner awareness for the organization and enhance the space. Paint. Paint is a relatively simple and inexpensive way to add interest to a space. Take-away: The space you create for your nonprofit impacts the people who make your mission happen, so say good-bye to grey paint, mismatched furniture, and that vase that was donated to you 20 years ago. Say hello, to a vibrant or warm welcoming new space. Sage Summit was a bustle of activity this year. The usual meeting and greeting of customers and partners along with some great educational discussions were abundant. 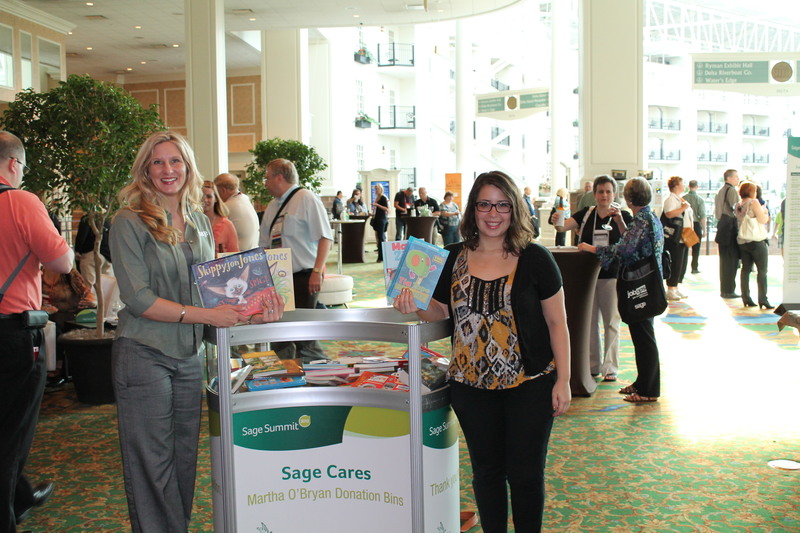 For me, the highlight was Sage’s continued commitment to partner with a nonprofit customer to give back through Sage Cares. This year’s customer was Martha O’Bryan Center and together with our customers we were able to add several crates of books to the library at the center along with a small monetary donation. The center is a family and community resource center located in one of Nashville’s poorest neighborhoods. They provide a continuum of evidence-based, education-focused programming for children, youth and adults in poverty. Martha O’Bryan Center’s goal is that all children and youth in their community will have access to quality education and successfully transition to college and a career, while supporting the whole family to overcome barriers to success through education, crisis management and community resources, and a long time Sage Nonprofit customer. They are truly AMAZING!!! Take-away: Meeting with the development director and having the opportunity to share in what they do, even in a small way, made for a tremendous week.